RIM nearly axes Android emulator, calls Google Play "chaotic cesspool"
Citing piracy concerns, a RIM executive by the name of Alec Saunders suggested the company was planning to eliminate Android app side-loading from the Blackberry Playbook. However, Saunders has since withdrawn from this position, clarifying that side-loading support will actually remain in Blackberry Playbook OS and BB10. According to their developer blog, RIM will be changing how the feature works though in order to curb piracy concerns. Side-loading, as RIM calls it, is a sanctioned method of running Android apps on your Blackberry Playbook. 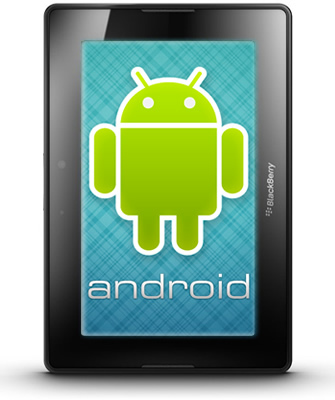 The feature was introduced nearly a year ago in an attempt to boost Playbook sales. In February, the feature was being peddled to developers by luring them in with a free Playbook -- an enticing reward for any developer willing to convert an Android app over to Blackberry Playbook OS. We’re not getting rid of side-loading on the BlackBerry PlayBook OS or in BlackBerry 10. Side-loading on our platform is changing in nature. Side-loading is a developer feature. It exists so that developers can load their apps onto their own devices to test. It’s there so developers can send a beta release to their testing community for review. It is definitely not there for some people to side load a pirated app. Although Saunders seemed to clarify the situation, it appears RIM may be confused about what direction side-loading will take. The Verge received this communique which suggests pulling the plug may still be an option, despite Saunder's reassurance. We are looking at different options including removal or evolution of our current side loading functionality. In the event that we do decide to go down that path, we will definitely work with developers to ensure we have a fully functioning way for them to test applications on hardware. However, we haven't finalized or officially announced any plans yet. The reason side-loading has been under fire is due to piracy concerns. In a tweet, Saunders revealed that piracy is a "huge" problem for Android and RIM doesn't want to duplicate the "chaotic cesspool" that is Google Play (formerly known as Android Market). As a result, Saunders claims Blackberry may be moving to a more Apple-like model where AppWorld will be the only way to download apps to any Blackberry device. As a preliminary step toward that model, the next Blackberry Playbook OS release will protect apps with encryption. The encryption will ensure only the original purchaser can run the app.